Scars and keloids occur after an insult to the skin, be it surgery, trauma, or pre-existing skin disease such as acne. Acne scarring may be ice pick (small, deep pits), boxcar (larger, shallow pits), or rolling. 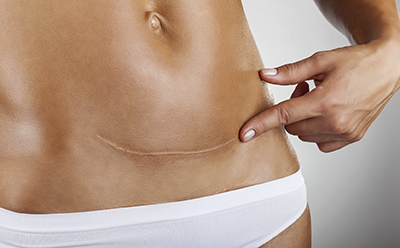 Based on the scar pattern, an ideal treatment is tailored to the patient. We offer a number of minimally invasive scar treatments including injections of steroids, fat, and other medications, as well as nonablative fractional laser therapy (Fraxel®, Clear + Brilliant®) and surgical removal, as indicated.